Well, I get bored of things fast so every batch of bliss balls is a new flavour - but lately this one seems to be made on repeat. I love cinnamon. Like... I have to buy the giant container of cinnamon from Costco kinda love. This raw bite recipe has just the right amount of cinnamon and a whole lot of chewy, cookie dough like goodness - meaning it's pretty much the perfect snack! Oatmeal Raisin Cookies are one of those baked goods I feel are always overlooked. They don't have chocolate - and oats and raisins are considered "healthy" items and people don't exactly go looking for cookies when they're feeling like something healthy... do they? But to me? They're one of the best cookie combinations. That almost nutty like flavour of the oatmeal, paired with chewy raisins? Heaven. 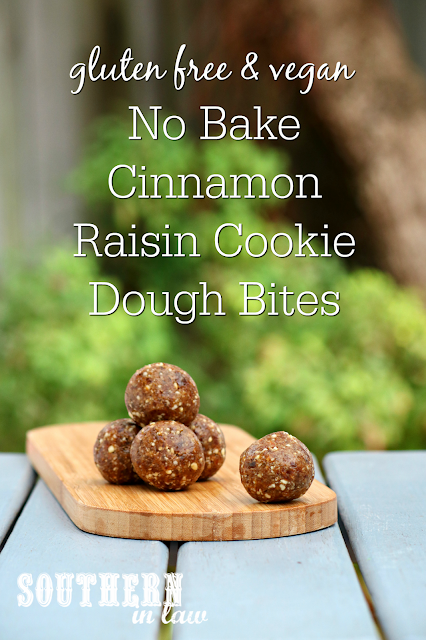 These Cinnamon Raisin Cookie Dough Raw Balls are currently my favourite because they have all the things I love about an Oatmeal Raisin Cookie - with only half the work. There's no baking, waiting for dough to chill, messing about with creaming butter and sugar - all you have to do is throw the ingredients in a food processor, process and you're good to go. And let's not forget they're healthy too! These raw bites are also vegan, sugar free and freezer friendly too - making them the perfect meal prep recipe! Place all of your ingredients in a food processor and process until all of your ingredients are chopped and mixed together. If needed, add a teaspoon or so of water to bring your mix together (you will only need to do this if it's very crumbly!). Once your "dough" has clumped together and no big chunks remain, roll your mix into bite sized balls. Enjoy immediately, chill in the fridge to enjoy later or freeze to defrost and eat in the future. These bites will keep for 1-2 weeks in the fridge in an airtight container (they could probably last for longer... but we have never been able to keep them that long!). *Find out more about oats on a gluten free diet. 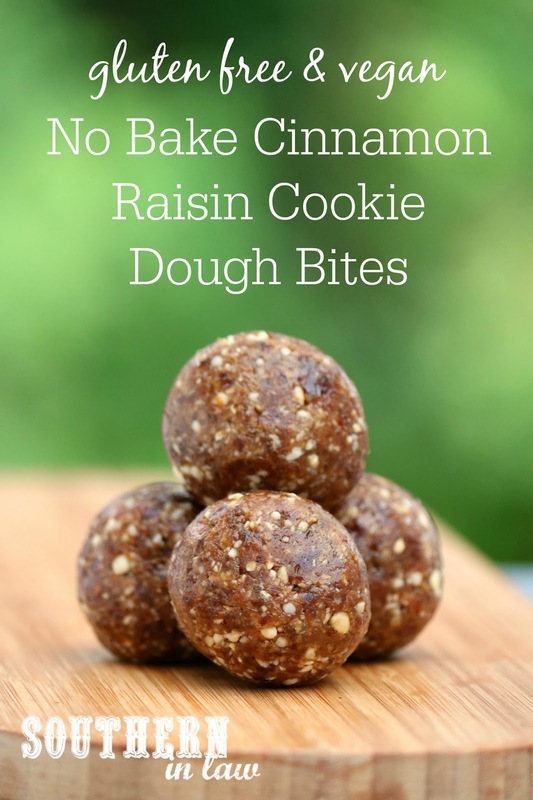 If you can't eat or don't have oats, you can also use quinoa flakes or coconut flour instead. For quinoa flakes, use 3/4 cup - but for coconut flour, use around 1/4 cup or just as much as needed to bring the mix together. 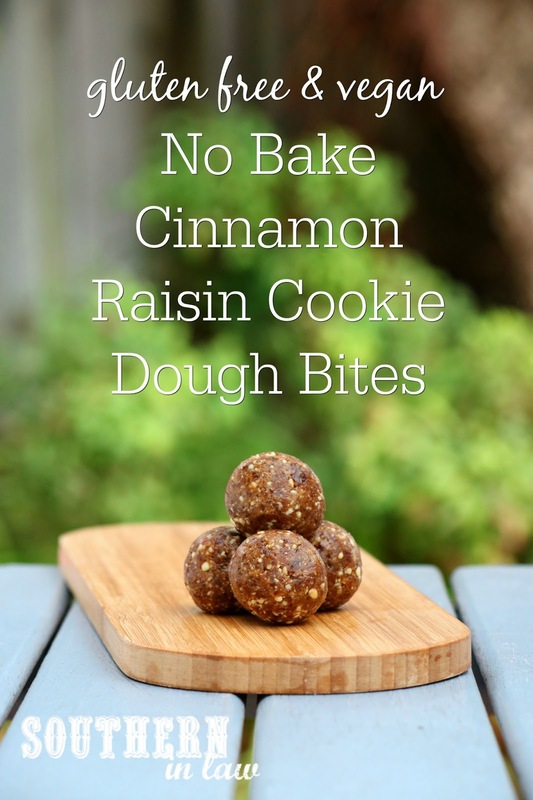 Do note, however, this will change the flavour of the bite and you won't have as much of a "cookie dough" taste. What's your favourite cookie flavour? And what's your all time favourite baked good? I can never pass up carrot cake - or banana bread!